Christmas is a holiday steeped in tradition. Rooted in the religious traditions of the Christian church, the popularity of the many holiday practices surrounding Christmas have taken on a life of their own in much of the Western world. 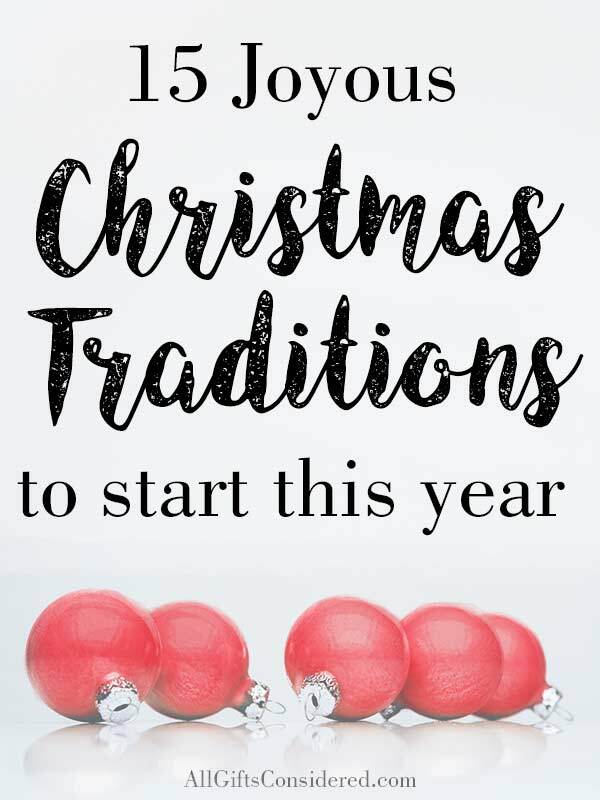 Whether you are a Christian or not, you probably have Christmas traditions that your family practices. Gift giving, decorating evergreen trees, colorful lights, Christmas dinner, snowman sugar cookies, peppermint hot chocolate; these are traditions shared and beloved by many. Religious practices include reading the Biblical Christmas story, giving to the poor, going to church, singing Christmas carols, lighting Advent candles, a special Christmas Eve service, manger scenes, and the star on top of the tree pointing to the newborn King and Savior. As these Christmas traditions are repeated year after year, they grow in meaning and significance. For myself, as I have grown older, I’ve come to appreciate the beauty of simple and meaningful traditions. Traditions are means by which we pass on our faith and values to our children. Traditions also help keep us rooted and centered in those very same things we value. Lastly, traditions are simply fun and enjoyable, a way to enjoy family, friends, and the many good gifts we have received. So for something as wonderful as the birth of our Savior, what could be more important than developing meaningful and fun Christmas traditions? Some of the traditions below are just fun ways to spend more time together as a family. Others are ideas to help Christians to celebrate and remember the birth of Jesus. Most of these are adaptable to wide range of uses with a bit of creativity. I hope this helps you and your household to start some new joyous Christmas traditions this holiday season! There are actually more than 15 ideas listed below, but several are variations on a theme. Some are silly activities, some are ideas to get your family invested in giving generously. All can become a source of holiday cheer and Christmas joy as your family turns them into traditions. An ornament set like this one includes one for each of the 25 days in Advent. (Well, technically 24 plus Christmas. But you get the point.) 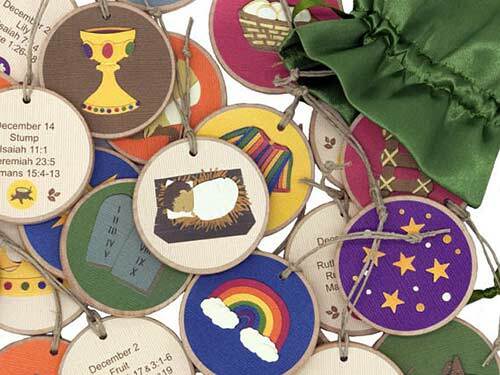 Each ornament has an image on it which corresponds to a Scripture verse that tells the grand story of redemptive history. Our family has done this for several years, and we all love it. In place of our regular evening family devotions, we do the Jesse Tree ornaments. Each kid takes turns finding and holding the day’s ornament, we read the passage, then hang it up on the Christmas tree. As Advent progresses and Christmas draws near, we get to hear (and see!) our great Family Story retold each year. It’s a warm and cozy holiday tradition wherein books are gifted on Christmas Eve. Everyone unwraps their books, grabs a cup of cocoa (or jólabland, for the adults) and snuggles down in bed to read and await the dawning of Christmas. This is one of our most favoritest Christmas traditions we’ve found in recent years. Read more about it here. You know the song. But did you know that the song is based on an actual Christmas tradition? Yep. The 12 Days of Christmas comes from the Christian church’s liturgical calendar. Excerpted from the website, Why Christmas?, here are the Twelve Days of Christmas and their meanings. Day 1 (12/25): Christmas Day. Celebrating the Birth of Jesus. Day 2 (12/26): St Stephen’s Day, aka Boxing Day. Stephen was the first Christian martyr. Day 3 (12/27): St John the Apostle. John was one of Jesus’s disciples and closest friends. Day 4 (12/28): The Feast of the Holy Innocents. This is when people remember the baby boys which King Herod killed when he was trying to find and kill the baby Jesus. Day 5 (12/29): St Thomas Becket. He was Archbishop of Canterbury in the 12th century and was murdered on 29th December 1170 for challenging the King’s authority over Church. Day 6 (12/30): St Egwin of Worcester. Day 7 (12/31): Pope Sylvester I is traditionally celebrated on this day. He was an early pope from the 4th Century. Day 8 (1/1): Mary, the mother of Jesus. Day 9 (1/2): St. Basil the Great and St. Gregory Nazianzen, two important 4th century Christians. Day 10 (1/3): Feast of the Holy Name of Jesus. This remembers when Jesus was officially ‘named’ in the Jewish Temple. Day 11 (1/4): St. Elizabeth Ann Seton, the first American saint, who lived in the 18th and 19th centuries. Day 12 (1/5): Epiphany Eve. Here are some more resources on the Twelve Days of Christmas. These will give you some background history and inspiration to start your own Christmas tradition. The Real 12 Days of Christmas from the History blog on Christianity Today. Twelve Ideas for Celebrating the Twelve Days of Christmas from the Reformed Church of America. The More Days the Merrier: Celebrating the 12 Days of Christmas from the U.S. Catholic website. Celebrating the Twelve Days of Christmas – One mom tells how her family celebrates the 12 days in their own special way. You probably already do something like this, but this type of simple, cheesy tradition brings cheer to your entire family. Do the same or similar thing every year, and your family with love it. We all know about the traditional Christmas dinner. Ham or turkey, stuffing, potatoes, cranberry sauce, eggnog. If you don’t already do this, you should! It’s like Thanksgiving 2.0. Perhaps a newer and more “fun” idea is the Crazy Christmas Dinner. Take the whole family shopping, and give them a small budget – say, $3-5 for littles or $10 for those in double-digits – and have them pick whatever they want. Then you go home and fix it all up and eat it by candlelight. You’ll never know how much fun your faily can have with Cheez Whiz, pickled asparagus, and croissants until you try it! Christmas traditions should start with giving. One great, fun, simple, and impactful way to do this is through Operation Christmas Child, a ministry of international relief organization Samaritan’s Purse. The goal is to use gift-filled shoeboxes to demonstrate God’s love in a tangible way to children in need around the world. Get your family together and get a few shoeboxes – you can order boxes through their website (many churches do this) or use your own. Fill it up with some age-appropriate toys and send it off to Operation Christmas Child. They will deliver it to kids who may not otherwise experience the joy of Christmas gift-giving. The cool thing is that they partner with local churches and ministers to not only present the gospel when they hand out the shoe boxes, but also to mentor, help, and disciple kids throughout the rest of the year. Boxind Day is a holiday celebrated the day after Christmas in the United Kingdom and a few countries historically connected to the UK. This is the traditional day on which the church collection boxes containing the alms for the poor were distributed. To observe Boxing Day as a contemporary Christmas tradition, some families make a practice of saving money throughout the holiday season to give to the poor. On Boxing Day (and after the frenzied excitement of gift wrapping has subsided), your family can make a point of giving the funds to those in need. This is a great way to “wrap up” the Christmas season in a way that puts others first. I know from my own childhood and also from experience parenting young kids that it can be hard for littles to get the focus off themselves when Christmas gifts are sitting there just begging to be opened. Choose a gift from Compassion International, to provide creative solutions in third-world countries with things like emergency food and water, bicycles, dental kits, chickens, goats, HIV/AIDS care, literacy classes for moms, and more. For more inspiration, here is a list of 21 Ways To Be a Little More Giving This Holiday Season. Also see next point. There are lots of fun ways your family can make generous giving one of your Christmas traditions. Here are several ideas. These last handful are simple, popular, and fun traditions that need little explanation. You may already do some or all of these. Pajamas. Kids get a set of PJs on Christmas Eve. Fun even when the kids already know what they’re getting. Cozy and fun. Christmas light tour. Popular on Christmas Eve. Or, to avoid the crowds, go on Christmas Eve-Eve. Candlelight service. Many churches celebrate the birth of Christ with a special service on Christmas Eve. Make it a tradition! Slumber party. Let all the kids sleep together in one room, or in front room. Many families we know still do this when their grown up kids come in to town for the holidays! Caroling. A classic way to spread holiday cheer through your neighborhood. Christmas movie. Lots of great films come out around the holidays; take the whole family to a fun movie at the theater. Tip generously. Plan a $50 or more tip for the wait staff if you go to a restaurant on Christmas. Anyone who wants or needs to work on Christmas Day deserves it. Surprise someone. Pay for someone else’s meal at the restaurant. What a great way to spread some Christmas cheer! Be sure to tip well to boot.